justthefood.com...the blog: BLT and Avocado Burger! Let me start off by saying, there is an INSANE amount of imitation bacon bits in this recipe! BUT, don't fret, just make your own! Seriously, though, what's a BLT without a ton of bacon? Mix together flours, bacon bits, garlic powder, onion powder and pepper. In a separate bowl, mix together tomatoes, oil, steak sauce and ketchup. Add wet to dry and knead together until uniformly mixed. Let sit 20 minutes. Preheat oven to 350 degrees and prep a baking sheet by lining with parchment or a silicone baking sheet. Divide mixture into 8 equal pieces, and flatten each piece. Place 1/2 of one avocado, mushed, into the center of 4 of the flattened pieces. Sandwich with the remaining four pieces and seal the edges. Bake, covered in foil, for 20 minutes, flip and bake an additional 15 minutes. Serve on a toasty bun with a schmear of vegan mayo and, of course, a nice leaf of crispy lettuce! Ok, the avocado inside looks like the most amazing thing EVER...my mouth is watering just thinking about it, and I'm wondering how I've never found my way over to your blog before. 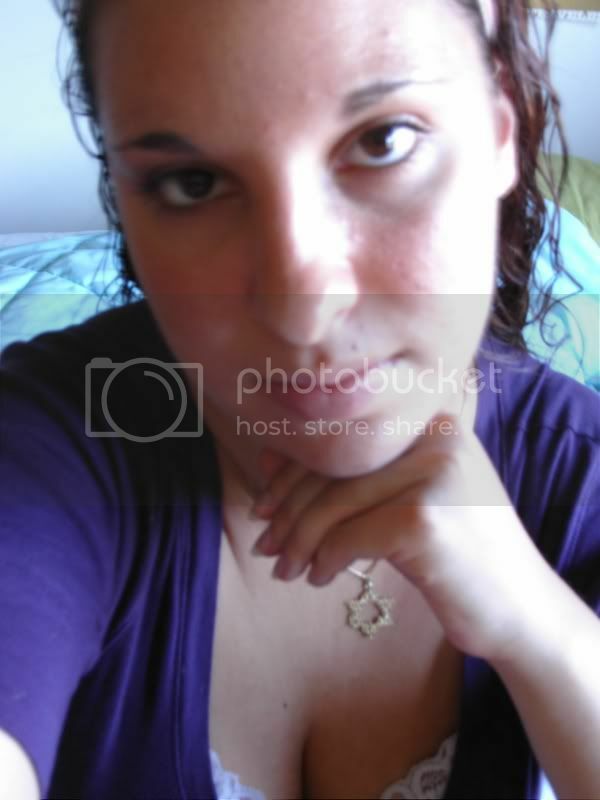 I added it to my blogroll, so I can get over here easy all the time. 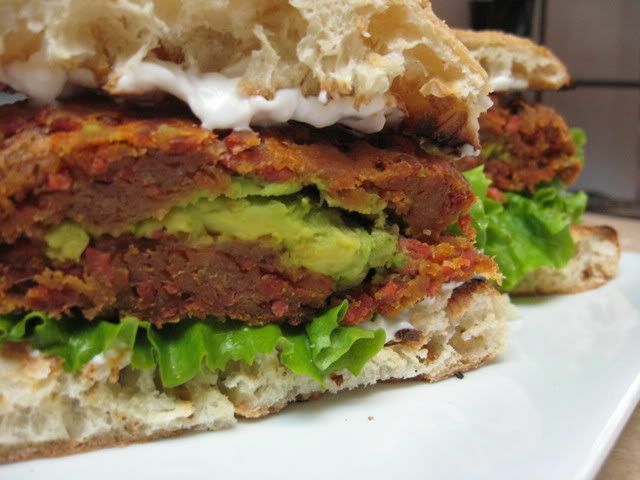 Ohh, avos and veggie burgers are a match made in heaven. I have a question though, I have never frozen avocado, nor do I know how avocados do with freezing/defrosting. Do you think these are fine to freeze? purplestick...It only makes 4 burgers, so if possible, eat 'em all within a few days. I tried freezing them, and they were okay, but a little tougher than I wanted them to be, but still edible. 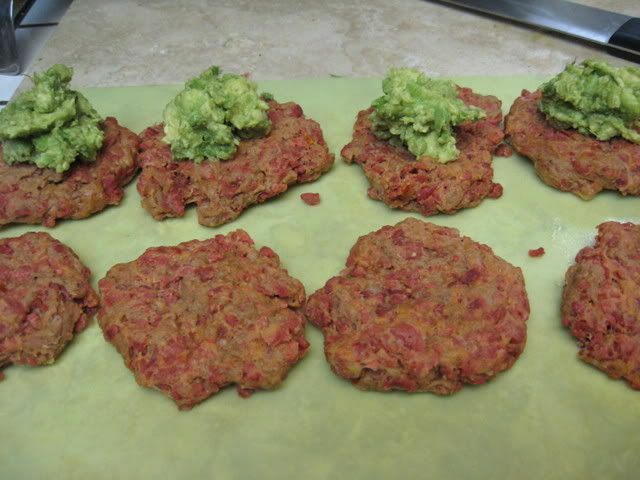 These burgers look great Joni! Did you make them with the homemade bits or store-bought? I love the new site! I'll try subbing the Baco bits for liquid smoke.....I'll see if that works. Seriously, these were defrickinlicious. A million thanks! I made these the other day. They were good. Having no baco bits, I used faken and I think that they just were not the right ingredient. Need to find some organic TVP and make my own bits. Wow, would LOVE to try these, but am allergic to wheat - is there a substitute for the vital wheat gluten, or could it be left out altogether? i made these last night, and wow - they are gigantic! i used your bacon bits recipe - awesome. there were only two of us, so i made two avocado stuffed, and i made the other two plain. they were very good. sort of reminded me of boca chicken patties. thanks for the recipe, i'll be making these again and passing the link along for sure! 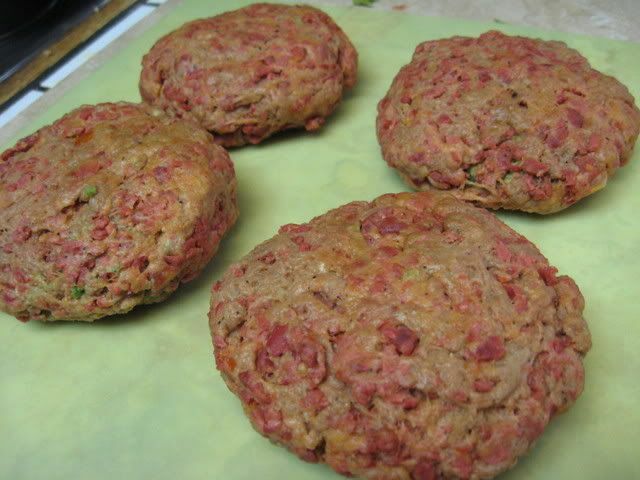 you guys are out of your mind... those 'burgers' look NASTY.... like something jake would eat. These look so delicious and tempting, but is there any way to make these without wheat or gluten? Thanks!